10 Apple Pudding To a quarter of a pound of Roasted apples beaten fine, put the yolks of eight & the whites of four eggs well beaten, half a pound of loaf sugar, the rind & juice of a lemon, three spoonfuls of Ratafia, and six ounces of clarified butter which must be mixed in by degrees just before you put the pudding in the Oven. Put puff paste in the bottom of the dish, & bake it an hour and a quarter. To preserve Strawberries. 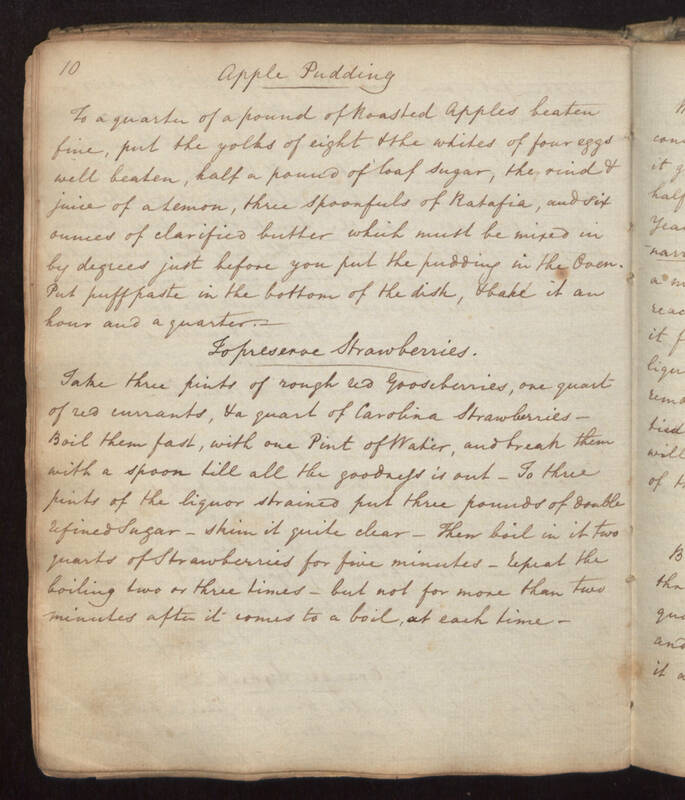 Take three pints of rough red gooseberries, one quart of red currants, & a quart of Carolina Strawberries. Boil them fast, with one Pint of Water, and break them with a spoon till all the goodness is out. To three pints of the liquor strained put three pounds of double refined Sugar. skim it quite clear. Then boil in it two quarts of Strawberries for five minutes. repeat the boiling two or three times, but not for more than two minutes after it comes to a boil at each time.